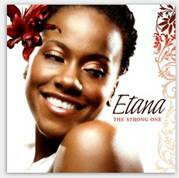 Etana, the captivating Jamaican singer/songwriter, will unleash her highly anticipated debut album, The Strong One, on June 17, 2008 on VP Records. Arguably the most prolific female vocalist in reggae today, Etana has struck a cord with the masses and is winning the hearts of the people one song at a time. She made her debut with the hit "Wrong Address" in 2006, "Roots" in 2007, "Warrior Love" in 2008, received numerous awards in her native country, rocked major stage shows and will now unveil her first studio album boasting production by reggae legends Dean Frasier, Carl James and Robert Livingston. The Strong One contains brand new material as well as her current singles that have already impacted Jamaican radio and other international reggae charts – including her sultry new love song, "Warrior Love," which is currently #1 on Jamaica, England, U.S. and Virgin Islands reggae charts, "Roots," the socio-political tune that remained at the top of Jamaican charts for over 22 weeks, as well as her breakthrough anthem "Wrong Address," "a heartbreaking acoustic reggae lament about a woman who gets rejected for a job because she comes from the wrong hood," stated from Spin Magazine. With spirit and song, Etana celebrates life and love, mends the disheartened and spreads wisdom throughout this cohesive musical testament. Born in Jamaica and raised in Miami, the talented artist landed her first major gig as a back-up singer for roots sensation Richie Spice. Since then, she has scored three solo #1 hits, toured the globe from the United States to Europe to Africa and was recently awarded Best Female Vocalist at both the Excellence in Music & Entertainment (EME) Awards and IRIE FM Radio Awards as well as the Best Solo Female Reggae Vocalist at the 1st annual Reggae Academy Awards. According to Vibe Magazine, "at 23, she has already established herself as a formidable performer and songwriter whose music and reputation precedes her." Incorporating elements of jazz, pop, rock and reggae, Etana has cultivated a pristine sound that touches on real life experiences and enlightens her listeners. "It is straight from the heart, straight from the soul, straight from the people and everyday life," as Etana describes. For press requests/interviews please contact Tiffany Mea at tiffanym@vprecords.com , WK: 718-425-1151. Thanks.